Every moment in life is an indication of the time ahead. Practically It is not possible to select time for our routine activities like going to office for work/job, coming back home, etc. But choosing the most auspicious moments for major events in our life, electional astrology should be considered, because work started in an auspicious moment is likely to be successfully accomplished. If you take care of the beginning, end will take care of itself is the rationale of Muhurata. In fact, Muhurata is a measure of time which means 2 Ghatis = 1 muhurata = 48 minutes. Muhurata signifies auspicious moment when planetary transition favors us in order to accomplish our work successfully. Once the auspicious moment is decided, our next step is to match its auspiciousness with the person concerned. Sun and Moon play significant role in Muhurata. An auspicious day is decided by Panchang Shudhi that is Tithi, Vaar, Nakshatra, Karan and Yoga are taken into consideration. After selection of day one is to choose an auspicious point of time which is called lagna shudhi. 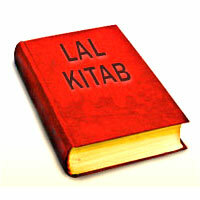 Decision of one’s destiny, wealth, richness and longevity is done by the creator at the time of his/her birth itself. The birth time of the child is an auspicious time of his life which has stored in itself all the data of the ups and downs i.e. auspicious and inauspicious moments. In the similar manner, muhurata of an important work takes care of the future of that work. For example Muhurata for marriage works as a window to preview the status of married life. And selection of time for a entering into a new house decides the happy and peaceful environment at home. This is the theory which is the root cause of its importance in life and that is the reason, by choosing the most auspicious moments; we can turn that work in our favour. Vedic astrology is based on three principles - 1. Sidhanta 2. Samhita 3. Hora Hora astrology deals with the analysis of native’s horoscope. 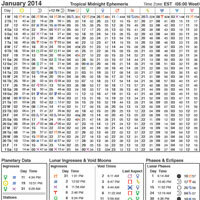 Sidhanta astrology calculates planetary transition, and lunar and solar calendars. In Samhita astrology muhurata, rising and setting of planets,. Matching etc. are considered and analysed. In this way, Muhurata is an important part of samhita Astrology. For calculation of Muhurata, Muhurat chintamani, the main scripture, is written by Ram Daivagya who was the younger brother of Nilkantha. The most famous interpretation on Muhuratachintamani known as Peeyushdhara was done by Shri Govind, son of Nilkantha. Selection of time (Muhurata) is decided in the following ways- 1. Ask the native, for which event he wants the muhurata to be decided and the favorable period i.e. which month, day etc suit him best. 2. Then select the month based on the event. 3. 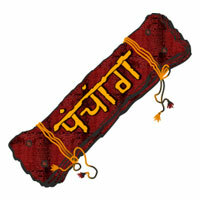 To take out the auspicious time for marriage, month may be selected on Sun’s strength also. 4. The month should be purified. Keeping in view planetary strength, holashatak, pitra paksha, combustion of Venus and Jupiter etc. 5. Panchang shudhi and lagna shudhi should be done. Panchang shudhi means - a good lunar day, beneficial week day, an auspicious constellation, a good yoga and a fertilizing karana. In the same way lagna shudhi should be done. 6. Decide chandra bal after calculating Moon’s strength. Avoid debilitated Moon and the transit period of Moon in 4, 8, 12 rashi from birth rashi. 7. The best Tithis should be selected and tell the native accordingly. Then select two or three tithis for commencing the work. 8. Now, to find out the auspicious time perform lagna shudhi. If the native is short of time and can not wait for months to accomplish the work, month purification may be avoided and Muhurta is selected just after panchang shudhi and lagna shudhi. If, the native is unable to afford even this much period then just perform lagna shudhi. If possible time can be selected on the basis of an auspicious hora or chaughadia. One more opinion which is prevalent about the Muhurata is whenever one has high spirit to perform the task, it is the best muhuratha..Secondly, the strength of lagna takes precedence over planetary strength. Muhurata taken out on the basis of lagna shudhi is more auspicious than any other auspicious tithi. This rule is applicable in that case, when it becomes difficult to find out an auspicious tithi. Muhurata can be calculated just after lagna shudhi. 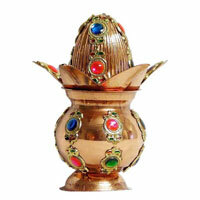 Abhijit Muhurata is also considered very important in selecting auspicious time. Abhijit muhurata is a period of 48 minutes which stays 24 minutes before and 24 minutes after mid-day or mid night. Work started in Abhijit Muhurata gets successfully accomplished. Abhijit Muhurata can be used in case one is short of time. Our scholars and seers of astrology stand uniformly at least on the subject of calculation of Muhurata. Generaly, they have difference of opinions in predictive astrology and differ more on remedial measures. It may be because many items are related to planets and remedies suggested either in form of donation, immersion or in acceptance of those items by our astrologers. Some astrologers emphasize on chanting the mantras to ward off the malefic effects. Diversification of opinion is a common phenomemon among the astrologers since long. But astrologers win the faith of masses in elective astrology as base of calculating the muhurata is same, hence they come out with the same muhurata for any important event. Subject like Muhurata has been widely written by our astrologers, but the discussion regarding its basis of the calculation has not been checked. That is why, Muhurata can not be termed scientific rather it is left with the crutch of faith and reverence only. For example selection of day and time to perform marriage is not sufficient to predict marriage performed in this period shall yield fruitful results. A majority of astrologers have tested the importance of muhurata for successful accomplishment of the work and found failure if work is done without considering Muhurata. So, it is mandatory to utilize electional astrology in life in order to make our life more prosperous and happy. 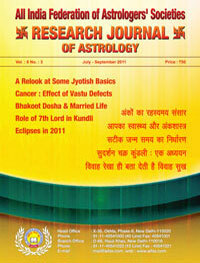 In this issue of Research Journal of astrology there are several research oriented articles on Numerology, Astrology basics, Sudarshan Chakra, Marriage and Muhurat.